At WWDC yesterday evening Apple launched a renewed assault on the high-end tablet market. The new iPad Pro in both 10.5- and 12.9-inch models is said to deliver the "world's most advanced display", and improved performance thanks to its new A10X Fusion chip. In related news there's a new Apple Pencil and Smart Keyboard to aid productivity with these tablets. Last but not least, Apple iOS 11 will deliver powerful new features to the platform when it becomes available in autumn. 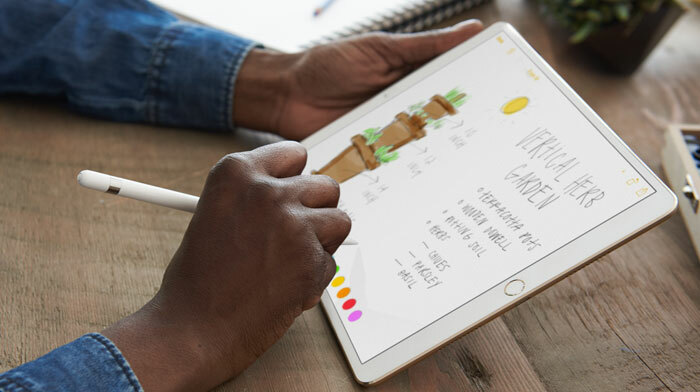 To be clear, the iPad Pro models are aimed at content creators and as such are sold at quite a premium over the regular iPad and iPad Mini models. "These are by far the most powerful iPads we’ve ever created with the world’s most advanced displays featuring ProMotion, the powerful new A10X Fusion chip and the advanced camera system of iPhone 7," said Greg Joswiak, Apple’s vice president of Product Marketing. "Together with iOS 11 these new iPad Pro models will radically change what users can do with iPad." The new 10.5-iPad Pro replaces last year's 9.7-inch model. Apple says its Retina display is 20 per cent larger but I'm not sure of the maths behind that claim. In other comparisons, Apple describes the 10.5-inch iPad Pro's screen bezels as 40 per cent smaller. As a whole it measures 251 x 174 x 6.1mm and weighs in at about 470g. The 12.9-inch iPad Pro measures 306 x 221 x 6.9mm and weighs about 680g. Other than their sizes and mass the two new iPad Pros are identical. Actually, the 12.9-inch model has a larger battery but the net effect is that both models offer the same battery life. Likewise with the screens, the larger model offers more pixels to maintain the 264ppi density. Apple's 64-bit A10X Fusion chip combines a 6-core CPU and 12-core GPU deliver up to 30 per cent faster CPU performance and 40 per cent faster graphics performance than the previous gen A9X chip. The performance facilitates "complex tasks like editing photos and 4K video, rendering 3D images or playing games", says Apple. Content creators might be especially pleased with the camera upgrade to the same as those featured by the iPhone 7 - front and back. 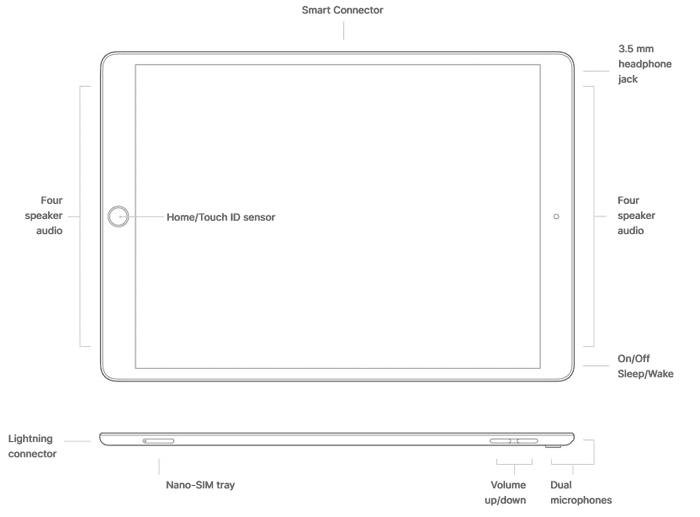 The iPad Pro also features a four-speaker audio system for multimedia enjoyment, plus dual-microphones for audio-in. A 3.5mm headphone jack is still present and correct. Apple is still using the Touch ID button on the iPad Pro bezel. Apple makes great claims for the new iPad Pro displays. A new technology dubbed 'ProMotion' is present. It sounds like Apple's take on variable refresh rate (VRR) technology. The new iPad Pros offer screens with a faster refresh rate (up to 120Hz) "for fluid scrolling, greater responsiveness and smoother motion content". Thanks to ProMotion, the iPad Pro reduces power consumption by lowering refresh rates to match the movement of the content. The display also gets praised for its brightest output ever, with TrueTone white balance adjustment, an anti-reflective coating, and wide colour gamut. 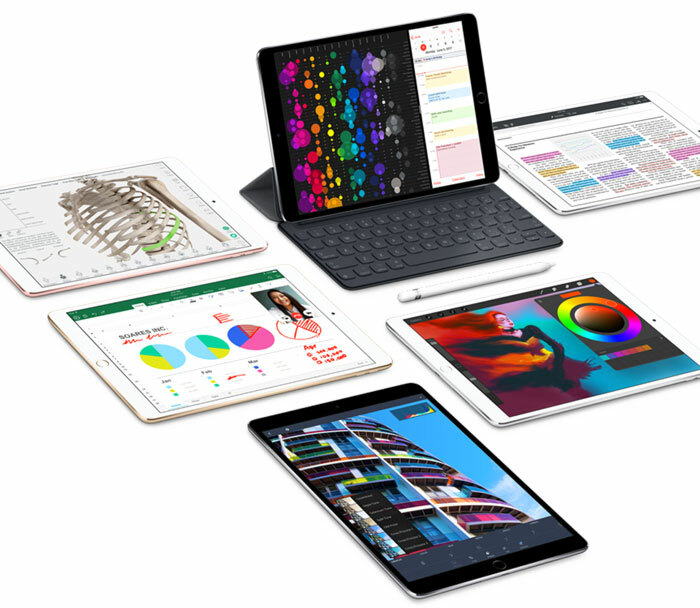 With the new size iPad Pro 10.5-inch arrival Apple has created a new full-sized Smart Keyboard. It is said to be thin, yet durable, without the need for charging or pairing, and doubles as a protective Smart Cover. Thanks to the new screens equipped, Apple Pencil is more responsive than ever with a 20-millisecond latency for fluid and natural drawing. The new iPad Pros are available online immediately (UK store link) with deliveries starting next week. 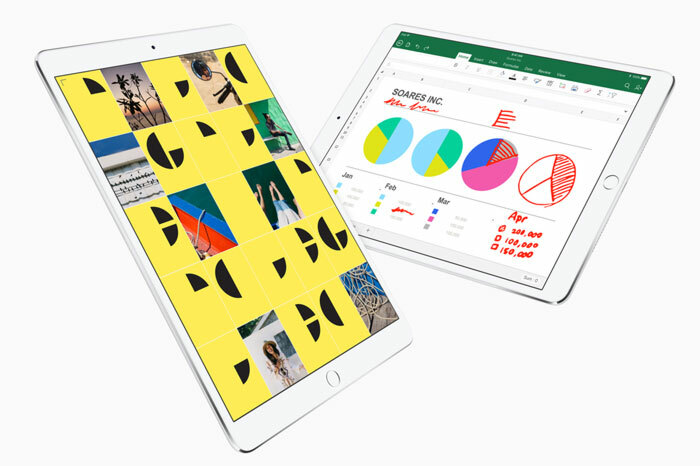 Apple iOS 11 is arriving this autumn and will enhance the capabilities of Apple's mobile products, including these iPad Pros. Key updates to the OS include; a new customisable dock, better multitasking, a new Files app, multi-touch drag and drop, and deeper OS integration with Apple Pencil. Still uses iOS. Until it actually uses something more than a mobile OS, this is not a productivity device.